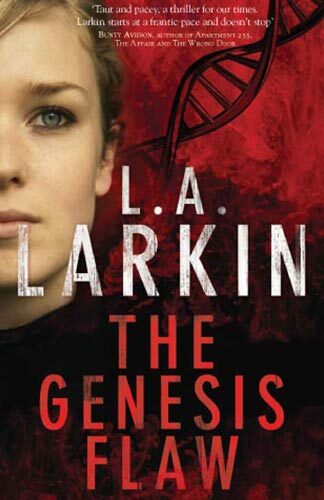 Book Synopsis: I was keen to read The Genesis Flaw after meeting LA Larkin at a writers’ festival on the Gold Coast. I was impressed by Larkin’s account of the research that went into the book, which included consulting with world-renowned geneticists, working closely with a computer hacker, and even attending a hackers’ conference. (Larkin gave the audience at the SheKilda Women Crime Writers’ Convention in October 2011 a heads-up on how to spot the detective at a hackers’ conference: ‘He’s the one with the tan’). The novel was engaging from the start, but it really took off for me around the halfway mark when Larkin ratchets up the suspense so much, I could hardly put it down. The Genesis Flaw contains all the requisites of the thriller genre—violence, action, chase scenes, narrow escapes from life-threatening situations, and a dramatic climax. What lifts it for me into a genuinely interesting realm is how Larkin humanises the central character, Serena Swift. Yes, she is ‘ballsy’ (strange choice of adjective to apply to a woman notwithstanding) and resourceful, well-groomed and savvy. But Larkin acknowledges how she is vulnerable in the most visceral sense because she is a woman, resulting in some genuinely creepy but credible scenes in the book. Some attempts at lyricism fall flat and there’s an awful amount of alliteration—Serena Swift’s brother is Keith, his wife Kerry and their daughter Katie, for example—but minor gripes aside, The Genesis Flaw delivers as an entertaining, at times enlightening read. I look forward to Larkin’s next novel Thirst, which is set in Antarctica, not only out of respect for her hands-on approach to fieldwork—I’m strictly a tropical settings researcher myself—but because if The Genesis Flaw is anything to go by, I’m in for a thrilling ride.